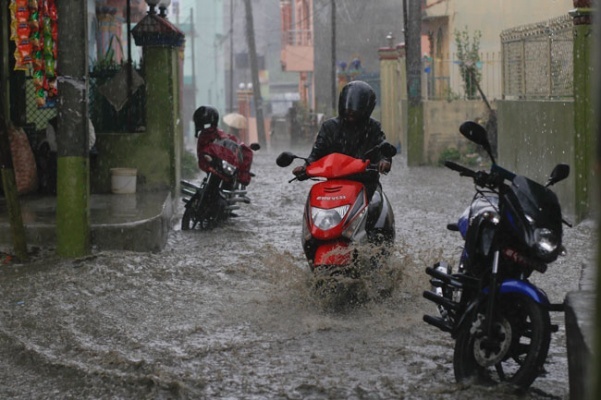 KATHMANDU, Aug 7: The incessant rainfall experienced in some parts of the western, central and eastern regions on Monday is likely to continue on Tuesday as well, the Meteorology Forecasting Division (MFD) has warned. Since the past few days, the country has been experiencing a strong monsoon pattern. However, according to meteorologist Min Kumar Aryal, the monsoon is likely to weaken from Wednesday onward. The meteorological station in Dang recorded the highest rainfall level on Monday, at 83.2 mm. Jiri, Taplejung and Kathmandu also received significant rainfall, measuring 72.8 mm, 55.7 mm, 50.3 mm respectively. According to the MFD, parts of the western and central regions are likely to receive heavy rain on Tuesday. The rainfall pattern should weaken on Wednesday. Meteorologist Aryal said there will be mostly light to moderate rainfall from Wednesday onward. Heavy rainfall affected the river hydrology to some extent. On Monday, the water level in the Bagmati in the central region crossed the warning level for a brief period. Some houses near the river banks were affected. However, the Bagmati receded soon after and it is not likely to rise again for now, according to the Department of Hydrology and Meteorology (DHM).“Water levels in all the major rivers are below the warning level. This level is not likely to be crossed for the next few days,” said DHM chief Rajendra Sharma. The department has urged locals living near major river basins and tributaries to remain alert. In particular, settlements in the vicinity of the Kamala, Khado and Ratu rivers need to stay alert.“So far, we have not reached a situation requiring us to disseminate information through mass SMSs,” added Sharma. But settlements near the Chure range continue to be at risk of flash floods. The department has not installed water measurement stations at gullies and streams in the Chure in view of their small size and seasonal nature. The current monsoon entered Nepal on June 8 and is now at its peak. July and August are considered the peak time for the monsoon. It becomes weaker around the end of August and the country enters the post-monsoon phase in September.